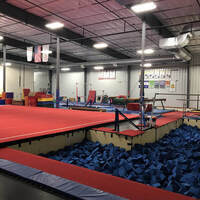 NMU Gymnastics Club has an ALL CAMPUS open gym every Thursday from 8pm to 9:30pm at Peak Gymnastics & Fitness. Open gym costs $5 per student. No gymnastics experience required. Come have fun with the spring floor, trampolines, climbing rope, male and female gymnastics events, and foam pit! No obligation to the club. Bring a friend or come alone, you'll have fun no matter what!